Are you looking to buy a treadmill in the near future? Walking into a fitness store can be an overwhelming event. There’s typically a wide variety of equipment to view and consider buying for your home. But it doesn’t have to be a fearful experience. Armed with some sound advice, you can find the perfect treadmill to bring home and enjoy for years to come. Knowing a little in advance what you may be looking for will help your specialty fitness retailer provide suggestions on the treadmill for you. 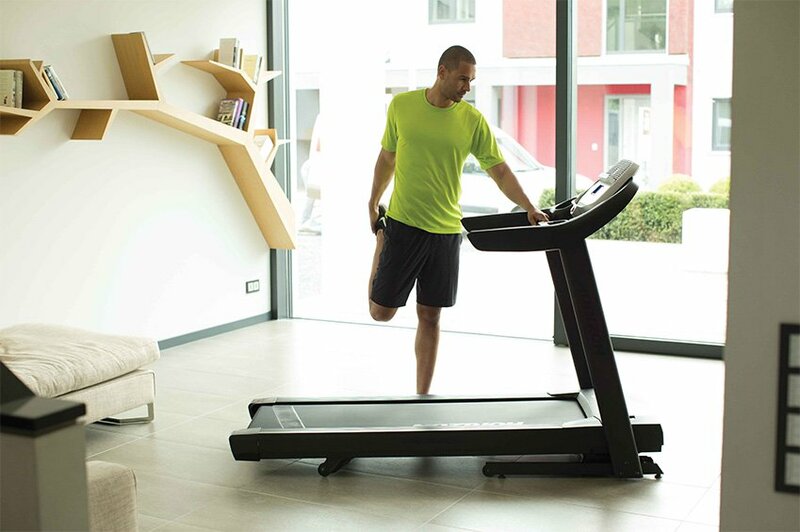 Here are seven tips to consider when purchasing a new treadmill. This advice should be applied to the purchase of any piece of fitness equipment. The way a treadmill fits and feels to you is perhaps the single most overlooked consideration and will have a tremendous influence on whether or not you enjoy using it and whether or not you want to get on and use it again. Reviews are helpful, but do not rely on reviews alone. Even if you shop direct from the manufacturer, usually you can find a store that carries the machine you want to try. Know where you want to put the machine and measure the space before you go shopping. If you are considering a folding unit, know that this feature adds to the cost of any unit and ask yourself if it is a necessary feature, meaning will you actually fold it up when you are not using it. Walking can, in many cases, create more work for a motor than running. This is because at slow speeds the amount of time your foot is in contact and “dragging” or being pulled across the deck surface is longer than when running. Your push off at the end of a running stride will also “push” the belt. This push is missing while at walking speeds. This “push” also occurs when walking at inclines, both of which assist the motor. When the motor is running fast it also has the assistance of inertia. There is a varying degree of quality and effectiveness in programming options, but in general, programs should help you achieve your goals faster while keeping you engaged in your workout. Ask yourself if your current or past “routine” is getting or had gotten you the results you are after. Ask your sales consultant if the unit has any programs that are specific to the goal you are trying to achieve. Great examples of this would be Sprint 8®, Glute Burn, 5K, HR Control and Virtual Active™ programs. Are the controls for speed and incline displayed and accessible in a way that is easy and comfortable for you to use when walking or running on the treadmill the way you will use it at home? Can you change speed and incline while running or walking at full stride or a high incline without jeopardizing your safety? Again, it is important that you try the treadmill before you buy it, go shopping in comfortable, preferably workout, clothing. Don’t forget to consider the design of the side steps: Are they wide enough, and are they slip resistant? Buy from a dealership/salesperson that you can come back to for support and questions after the sale. Although a treadmill purchase can be a pricey endeavor, remember that it is still a mechanical item with many moving parts that must work in unison. And even the very best quality exercise equipment has the potential need for support and service. Know that a quality treadmill should last you for many years and that it is a long-term investment. Although everyone should work within their budget, don’t skimp where you don’t have to. This purchase is a long-term commitment to yourself, and you’re worth it. You don’t want something you won’t enjoy, and you don’t want to buy a treadmill every couple of years. Print these buying tips out, write them down or save them in a file on your computer. However you choose, make sure you consider these tips when walking into any fitness store to make the next treadmill purchase for your home.